There are some finite differences between the British Standard (New Zealand and Australian Standard are based on the British standard) and the American Standard. For example the American Standard makes mention of the undesirable presence of any white markings on chest, feet or muzzle, wheras the British standard doesn't. The fact that it isn't mentioned doesn't mean that it is correct tough. Anyone that has knowledge of the history, use and the purpose of Border Terriers appreciates that there are reasons for any descriptions in the standard. And that is where Interpretations come in. Both standards mention that the Border should have the head of an otter. 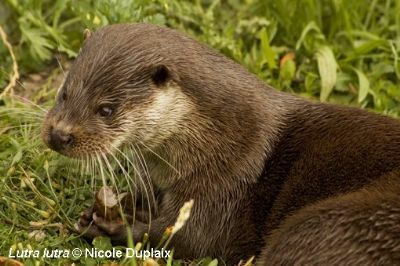 However it is important to note that the first standard was written in Britain and the otter being refrred to is the Eurasian Otter, Lutra Lutra, not the Otter seen in most zoos, which is the short-clawed Asian Otter. 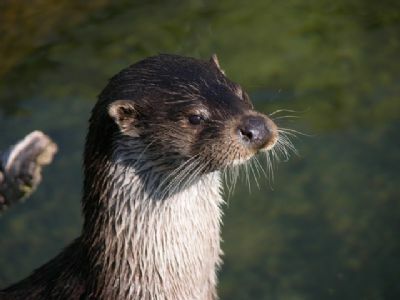 One notices that the Lutra Lutra has a much longer muzzle than the common short clawed Asian Otter, which relates to the observations from an expert Border Terrier judge and breeder in the next paragraph. This person also lectures other judges on the features of the Border Terrier head. An almost flat skull is asked for, fairly wide between the ears. The length twice its width. The muzzle in proportion one third to the skull two thirds is slightly rounded at the end, never pointed nor square. If the muzzle is too short the jaws lose power and the head appears out of balance. 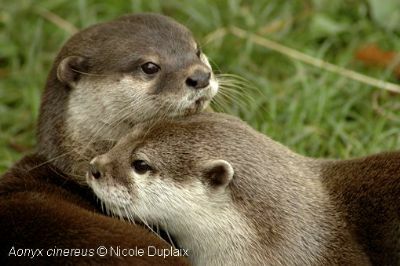 The important factor is that the Otter has no stop, just a slight indentation. The nose must be black in America, wheras a liver coloured nose is not considered a serious fault in the British standard. The Terrier needs a large nose with good nostrils when working, both to breathe through and to use as a scent detector. The Border's eye is dark brown, generous in shape, being slightly on the round side of oval rather than a full round eye. Set wide apart, neither to the front nor the side of the head. Some are set incorrect to the front, like car headlamps. The American standard differs from the British one by asking for and accepting dark hazel eyes. In Britain the eyes must be dark, the darker the better. In some of the older literature the Border's eyes are described as 'dark pools'. Small, V-shaped and of moderate thickness, darker colour to the rest of the cost is preferred. Not set on high on the head but somewhat on the side and dropping forward close to the cheeeks. They should NOT break above the level of the skull. In Britain a level bite acceptable, but not in America. There is a misguided thought that Border Terrier muzzles are supposed to be super short. While striving to breed towards ever shorter muzzles, sadly this idea has brought about many Borders with incorrect mouths and bites, repeating itself through generations. The correct ratio of muzzle to skull is one third to two thirds. If the shoulder is correctly laid, the neck will be fairly long, running smoothly into the withers. An upright shoulder produces a short neck. Straight and not too heavy in bone. Small and compact feet. A correct Border's body allows room for heart and lung expansion. A dog with the correctly carried back rib-cage will have correct under line. A Border should have a slight, almost imperceptible degree of chest showing in front of the front legs, if the shoulder and elbow are correctly laid. Exaggerated forechests are not desirable in the breed, neither is the total lack of this, which would denote a 'terrier front' caused by a steeply angled elbow. Muscular and racy, with thighs long and nicely moulded. Stifles well bent and hocks well let down. Feet small and compact.The leg from hock to foot should be perpendicular to the ground. Sickle hocks, caused by too much angulation in the stifle and hock, cause the leg from hock to foot to stand forward under the dog, instead of perpendicular. A sickle-hocked dog lacks second thigh development. Straight stifles, with the lack of second thigh muscle, and straight hocks, are frequently seen on Borders with short bones. Borders should have long bones. Stilted action which does not cover the ground results from lack of angulation in either the forehand and rear, or both. Small and compact - thick pads are essential. Moderately short and shaped like a carrot. The tail must be straight, free from kinks. A dog may carry the tail slightly bent. Seen from the front and rear, the legs should move straight. The front legs should move parallel to each other, neither wider at the top or at the bottom, and the feet should be neither swing out nor pin in. The hocks and stifles should turn neither in or out. A good mover will only show either the two front legs or the two hindlegs when coming and going, not four legs in a row. A good depth of jacket of the correct texture is vital to the breed. Borders stripped down to their underwear are not a good look, neither does it give the judge an opportunity to evaluate the dogs' coat quality. Being a working Terrier a Border must display a double coat, soft undercoat and a harsh top coat. Any departure from this is a fault. Red grizzle, grizzle and tan, red, wheaten, blue and tan. Black and tan is incorrect. A SMALL amount of white on the chest is not considered a fault, as long as it is not obvious when the dog approaches. White on feet, muzzle or lower jaw is a major fault! Sometimes those closely involved within a breed can lose sight of breed type but they see kennel type clearly. They can spot which dogs come from which lines with ease, but cease to notice when the dogs no longer look like Border Terriers.